56 rooms. All Non-Smoking rooms featuring microwave-refrigerator, iron & ironing board, coffeemaker, hair dryer, and 25 inch TV. Close to shopping and many popular restaurants Complimentary deluxe continental breakfast. 50 rooms. 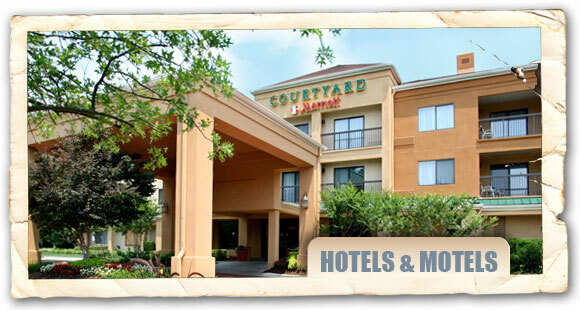 Pet friendly hotel featuring a daily light breakfast and refrigerators in each room. free WiFi access. Golf packages available. AAA and AARP discounts. 62 rooms. Affordable rates, microwaves and refrigerators. Free WiFi and Continental breakfast. Smoking/Non-Smoking. Pool. Conference room. Restaurant. 62 rooms. Luxury lodging at affordable rates, microwaves and refrigerators. High speed Internet. Continental breakfast. Smoking/Non-Smoking. Pool. Conference room. Restaurant. 77 Rooms. Smoking/non-smoking Deluxe Suites. Meeting room holds up to 10, Free deluxe continental breakfast. Full cable TV w/HBO. In room amenities include: coffee maker, refrigerator and microwave. Government, corporate, AAA/AARP discounts available. Complimentary pass to local health club. Under 12 stay free. Guest laundry available. Interior corridors. Business center. Numerous dining and recreational options nearby. 122 rooms. Non-Smoking rooms available. Shoney's Restaurant on site. Outdoor pool. Micro-fridge rooms and roll-away beds available. 15-20 person meeting room on location. Fax machine. Pets allowed. Weekly rates available. Non-Smoking and Handicap Accessible rooms. Guests are offered many amenities including free wireless high-speed Internet access in all rooms, free local calls, and an on-site exercise room. All spacious guest rooms and suites are air conditioned and come equipped with refrigerators, hair dryers, coffee makers, irons and ironing boards. Some rooms contain whirlpool bathtubs, and suites are available with microwaves. Coin-operated laundry facilities and vending machines are located on the premises for added guest convenience. This is a pet-friendly hotel; additional fees apply. Restaurants nearby. 2912 Parkway Blvd. (I-77, exit 65, behind McDonald’s, KFC, and the Front Porch Restaurant). 105 rooms. Smoking/Non-Smoking. Free 3 HBO, ESPN, USA & TNT. Complimentary breakfast and free local calls. Refrigerators/microwaves in some rooms, Free coffee makers. Exterior corridors. Complimentary pass to local gym. Parking for Buses, RVs & trucks. AAA, AARP, seniors, government, corporate and group discounts available. Weekly rates also available. Many restaurants and service stations within walking distance. 64 rooms. Smoking/Non-Smoking. Rooms with King or 2 Queen-sized beds, outdoor pool. 50-person meeting room, exercise room, guest laundry, data port entry phone, free local calls, free HBO cable TV with over 50 channels. Corporate, AAA and AARP discounts. No pets allowed. 68 rooms, Smoking/Non-Smoking. Restaurants nearby. Within walking distance of area attractions and shopping. 61 rooms. Smoking/Non-Smoking. Deluxe Continental Breakfast. Pool. Fitness Center. High Speed Internet. Food and spirits within walking distance. AAA and AARP approved. 58 rooms. Property features 13 premium rooms with microwaves and refrigerators. AAA & AARP discounts and golf packages available. Outside pool, fitness center, and. continental breakfast. 52 rooms. Non-Smoking room available. Interior corridors. Remote-controlled TV with HBO, meeting room, exercise room, deluxe continental breakfast. King Jacuzzi rooms available. Free local calls and complimentary newspaper. 96 rooms, all with micro-refrigerators. 24-hour restaurant on premises. Features the largest swimming pool on block. Free local calls, wireless internet. Hot deluxe breakfast, Jacuzzi rooms, 2-room suites available, banquet and meeting facilities, guest laundry, interior corridors. Accessible rooms. Amenities include: free local calls, morning coffee, expanded cable, outdoor pool, coin laundry, restaurant on site, truck parking and WiFi. Kids stay free and pets allowed.